For locals looking to eat out in Fife, the Tall Trees Restaurant is a much-respected establishment serving food seven days a week. The restaurant is in The Kingswood Hotel which is situated on the Fife Coastal Path between Burntisland and Kinghorn. The hotel provides ample parking and great views over the Forth towards Edinburgh. The restaurant gets its ‘Tall Trees’ name from the woodland surrounding the hotel. The big event for February is Valentine’s Day on Wednesday the 14th. 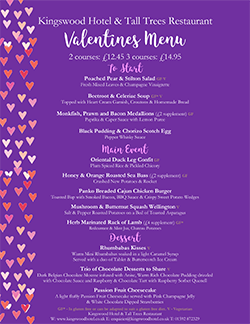 Nothing is more romantic than dinner for two, so for Valentine week, the Tall Trees Restaurant has produced a Valentine menu. This menu is available from the 10th of February to the 17th of February 2018 (excluding Sunday). It was during the spring and summer of 2017, the Tall Trees Restaurant introduced one night only theme night menus. These menus ran side by side with their normal menu giving their customers more choice. Fife diners were treated to Mexican, Italian and Indian cuisine. One of the most popular theme menus was their Chip Shop Menu. 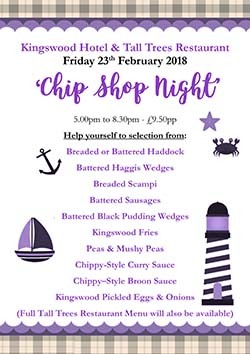 So the first theme menu this year will be the Chip Shop menu. The menu will be available for one night only, Friday the 23rd of February 2018. The Tall Trees Restaurant has always marked, on the menus, food that was suitable for vegetarians or those looking for gluten and dairy free dishes. Now the Tall Trees Restaurant has gone one stage further and produced a Vegan menu and a ‘Gluten Free’ and a ‘Dairy Free’ menu. Gluten Free items are prepared in the kitchens ‘GF Zone.’ The restaurant also has a dedicated gluten-free fryer. Although the Tall Trees Restaurant is in a secluded spot it is near two of the largest towns in Fife, Kirkcaldy & Dunfermline. Take a drive along the Fife coast and pop into the Tall Trees Restaurant. The staff will make you feel welcome.